Datema is a Sweden-based full-service provider of IT solutions for the retail, transport & logistics, and ERP consulting & integrations industries. Its IT specialists, consultants and application developers support over 600 companies in Scandinavia. With Exclaimer Cloud – Signatures for Office 365 we can easily assign signatures to different users and change them when needed. Datema had recently migrated to Office 365 and needed a solution to help manage Office 365 signatures for its four office locations in Sweden. 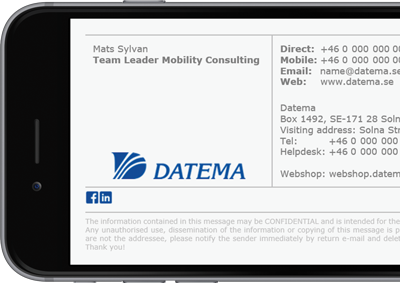 After a positive experience using Exclaimer Mail Utilities a few years earlier, choosing Exclaimer Cloud - Signatures for Office 365 was a simple choice for Mats Sylvan, Team Leader for Mobility Consulting at Datema. Implementing a cloud-based Office 365 signature management solution meant that Mr Sylvan can now create and apply signatures to users in all four Datema offices from one central, web-based location.